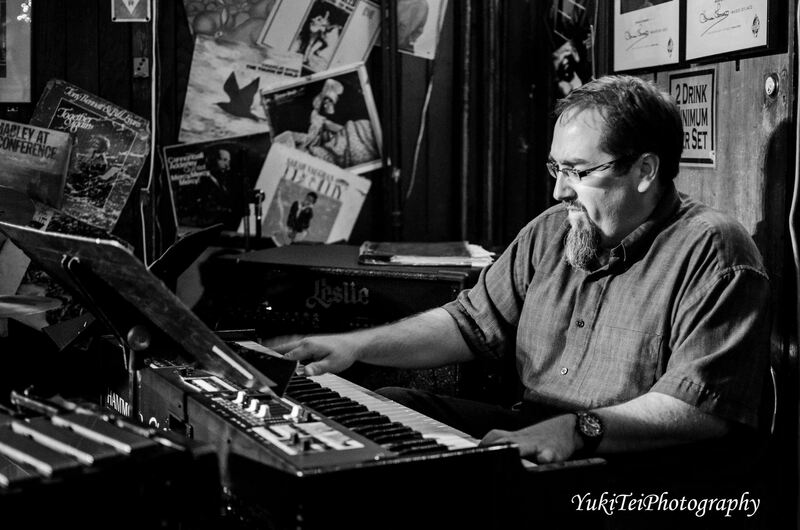 Though Ron Oswanski is one of the most prodigious Hammond B3 players on a jazz scene rife with rising organ talent, he’s just starting to introduce himself as a force in his own right. Also an accomplished accordion player, Oswanski has forged a lithe, lyrical and rhythmically charged contemporary sound steeped in the B3’s earthy roots but informed by post-bop developments. With his finely calibrated sense of dynamics and expansive harmonic palette, he can burn with the best of them, and then slow things down for an exquisitely crafted ballad. He showcases his multifaceted sensibility on his stellar CD December’s Moon, a revelatory debut album featuring heavyweights such as guitarist John Abercrombie, bassist John Patitucci, drummer Clarence Penn, and saxophonist Tim Ries, who produced the project. The CD will be released March 19, 2013 on Palmetto Records. possibilities of B-3 ensembles with his own ECM organ trio sessions, sets the tone on about half the tracks, applying his liquid tone to Oswanski’s impressive original tunes. The other half of the album is defined by the combustible rhythm section connection between Penn and Patitucci (on both electric and acoustic bass), including a seductive post-bop polka that hearkens back to Oswanski’s roots. Ries, equally effective on soprano and tenor sax, contributes memorably to the first 10 tracks, sitting out only for a captivating trio version of Kenny Wheeler’s “Kayak” with Abercrombie and drummer Ian Froman, and the startlingly beautiful closer, Fred Hersch’s loving evocation of Bill Evans “Evanessence,” by Patitucci, Penn and Oswanski on piano. Oswanski has been keeping company with formidable musicians for more than two decades. Since entering the jazz big leagues in the early 1990s as a teenager recruited by Maynard Ferguson’s Big Bop Nouveau Band, he’s collaborated with some of jazz’s most creative figures, performing with the Maria Schneider Orchestra, Tim Ries and The Rolling Stones Project, Jack Wilkins and Mike Clark, Milt Hinton, Myron Walden’s Countryfied, Dave Berger and the Sultans of Swing, as well as popular music icons The Temptations, Aretha Franklin and Blood, Sweat and Tears. Vibraphone master Dave Samuels, the driving force behind the Grammy Award-winning Caribbean Jazz Project, launched the Organik Vibe Trio several years ago as a vehicle for collaborating with Oswanski, leading to the enthralling 2010 session Moscow. He also plays widely with Israeli guitarist Oz Noy’s trio with drummer Nate Smith, the Dan Willis Band with percussionist John Hollenbeck, guitarist Sheryl Bailey’s Trio, and Carl Fischer’s (Billy Joel) Groove Project. Born in Toledo on March 17, 1974, Oswanski started serious piano studies as a child with Mark Kieswetter, an Ohio jazz legend whose credits include gigs with Zoot Sims, Jack Sheldon, James Moody, and a three-year stint as musical director for Jon Hendricks. At the same time, Oswanski got intimately familiar with the accordion, often performing with his father’s polka band. He started gigging widely as a precocious high school pianist, receiving invaluable experience with numerous Cincinnati tri-state jazz veterans, including Jimmy Cook, Paul Keller, Pete Siers, Ernie Krivda and Brad Sharp, who all generously mentored him. As an electric bassist, he gigged widely with Toledo jazz piano stalwart Eddie Abrams. It was Oswanski’s love of bass lines that drew him to the mighty B-3, an instrument introduced to him by Bill Heid, a well-traveled organist who has earned a cult reputation among B-3 fans. After winning numerous awards from the International Association of Jazz Educators, DownBeat magazine and an array of festivals, Oswanski earned a full scholarship to the Manhattan School of Music, where he studied with noted pianists Harold Danko and Garry Dial. Within months of moving to New York City in 1992, he got a call from Maynard Ferguson at the recommendation of Tim Ries, a friend since the older saxophonist took the junior high jazzhead under his wing. He spent five years with Ferguson playing piano, keyboards and B-3, and managed to finish his undergraduate degree between international tours. Ferguson also featured Oswanski on two Concord Jazz albums, 1995’s These Cats Can Swing and 1998’s Brass Attitude, which includes two Oswanski originals (on the new album he revisits one piece, the gorgeous ballad “Milk of the Moon” that Ferguson hailed for “subtlety, colors, and beauty” hinting at “the writing of Gil Evans”). By the time he came off the road with Ferguson, Oswanski was looking to focus on the B-3. At the time there were only a handful of organ players extending the instrument’s post-Larry Young vocabulary. In demand as an accomplished accordionist endorsed by Victoria Accordion Company, he works in a wide array of musical settings. Oswanski’s busy calendar as a session player and sideman is one reason that he’s making a relatively late debut as a leader. Another is that for more than a decade he’s helped run drummer Martin Paglione’s Applied Microphone Technology, a company devoted to making mics designed for specific instruments. He got involved with AMT because he helped them design an accordion microphone system out of his quest for accurate, high quality sound. Now the jazz world is getting a chance to hear just what sound Oswanski has to offer.